Get ready to do a little entertaining and a whole lot of relaxing when you choose to camp with this double-slide Volante fifth wheel. 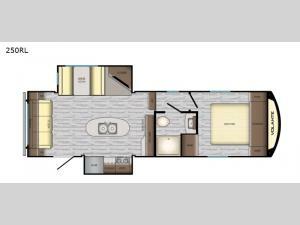 In the rear living area you will find plenty of seating with the 72" sofa and booth dinette that will allow you to enjoy your meals, play a card game, or sleep peacefully at night. The kitchen has all of the amenities that you would expect to find at home, plus an island with a double sink, and at night you can head to the private bedroom where you will find a queen-size bed and plenty of storage for all of your clothes.